Clicking through camera trap folders and then different date folders in search of priority species, is one of the tasks that the volunteers of the Leopard Survey are asked to help with. Each reserve that the survey is based at provides the team with a list of species; species that the reserve staff are interested in, be it general health, density estimates and safety reasons (snares and poaching). 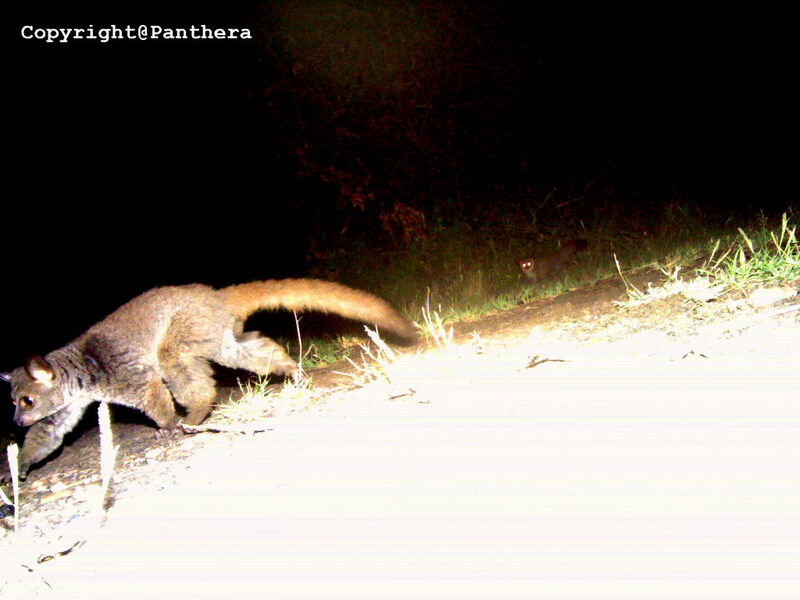 The camera traps provide a necessary watchful eye on the animals in the reserve. Leopard Survey volunteers were delighted when they came across an animal they had never seen before. This image was also the first time we had captured this animal on a camera trap during the Ithala 2018 survey. Needless to say we were all very excited and headed straight to the reference books to learn more about this secretive animal. Galagos are listed as of Least Concern on the IUCN Red List. This means that the number of Galagos in the wild is stable. The Thick-Tailed Galago (Otolemur crassicaudatus) is the largest of the Galagos. This primate is one of the smallest and most unusual on the planet. Living in the wild can a dangerous place for a little creature, so Galagos are equipped with two special features that help them stay aware of what is around them. Large eyes are probably one of the most prominent features on the head of a Galago. They provide excellent night vision allowing them to see food items as well as predators in the dark – a vital adaptation for nocturnal animals. Their ears are very large in relation to the size of their head and they have four ridges. Ears can be folded and unfolded, and thanks to these folds, Galagos can detect the slightest sounds coming from all directions. This combination of good hearing and great eye-sight helps these animals stay safe. Galagos are listed as of Least Concern on the IUCN Red List. This means that the number of Galagos in the wild is stable. Wildlife ACT and Ezemvelo KZN Wildlife are dedicated to the conservation of all African animals, and with the Panthera camera traps, the Leopard Survey team are able to monitor all animals, large and small that pass by the cameras.